The Toronto Raptors have a new big man coming to help their push for the top spot in the Eastern Conference. In the meantime, the Raptors won by playing small. 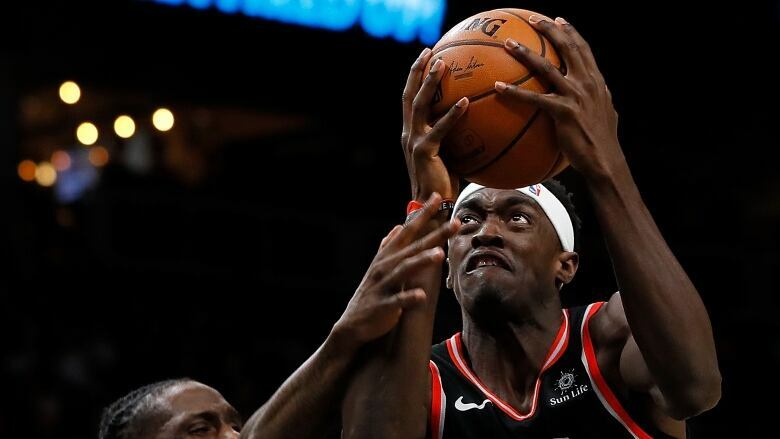 Pascal Siakam scored a career-high 33 points, Fred VanVleet added a career-best 30 and the Raptors rallied after trailing by 17 points in the first half to beat the Atlanta Hawks 119-101 on Thursday night. Toronto, which pulled within 1 1/2 games of Eastern Conference leader Milwaukee, acquired centre Marc Gasol from Memphis before Thursday's trade deadline for Jonas Valanciunas, C.J. Miles and Delon Wright, and a 2024 second-round draft pick. The team should learn Friday when to expect Gasol's arrival. "There are a lot of positives that come with a guy like Gasol and I think most of them come with being battle-tested," said Raptors coach Nick Nurse. "He's got a hell of a career under his belt." The Raptors were short-handed after trading four players in two deals. Toronto also traded centre Greg Monroe to the Nets for cash considerations. Toronto used only nine players and relied heavily on Siakam, who also had 13 rebounds, and VanVleet with All-Star Kawhi Leonard resting. Atlanta led 66-49 in the second quarter. "I give them credit, man, they came out guns a blazing," Nurse said of the Hawks. After their big deficit, the Raptors used an 11-0 run to launch their comeback. Danny Green, who had 12 points, sank three free throws to cap the run. The Hawks scored 68 points in the first half and only 33 after halftime. "We thought it was going to come easy for us in the second half and it didn't," said Hawks coach Lloyd Pierce, who added, "Finish has been a key word for us all year. ... I thought we were complacent." Davis told the Pelicans he wanted a trade, and James has made it clear that he'd love to play with him. But for now, their time as teammates will be limited to All-Star weekend. James chose Kevin Durant with the No. 1 overall pick, as he did last year in the All-Star draft, to be one of his starters. They'll be joined in the Team LeBron starting five by Kyrie Irving, Kawhi Leonard and James Harden. Team Giannis, in addition to Antetokounmpo, will start Stephen Curry, Joel Embiid, Paul George and hometown favourite Kemba Walker. Antetokounmpo took his Milwaukee teammate Khris Middleton with the first pick in the reserve round, along with Nikola Jokic, Ben Simmons, Blake Griffin, D'Angelo Russell, Nikola Vucevic and Kyle Lowry. James took Davis, Klay Thompson, Damian Lillard, Russell Westbrook, LaMarcus Aldridge, Karl-Anthony Towns and Bradley Beal. James managed to make a trade, convincing Antetokounmpo to swap Westbrook for Simmons — and give the Bucks' star the chance to have Westbrook and Embiid together, as he said he wanted. The NBA signed off on the trade. That left the third round and the decision between the two special additions to the game by NBA Commissioner Adam Silver — those being Dwyane Wade and Dirk Nowitzki. James took Wade, his former Miami and Cleveland teammate and longtime close friend. That left Nowitzki for Antetokounmpo's side.